1. The Playing Field. RULE 1.01 G.
The kicking box is a rectangle with the front of the box aligned with the front of home plate and the back of the box aligned with the sideline cones behind home plate. Lines extending forward from the sideline cones perpendicular to the front of home plate make up the sides of the kicking box. The area directly forward the kicking box is fair territory (see Diagram 2B). 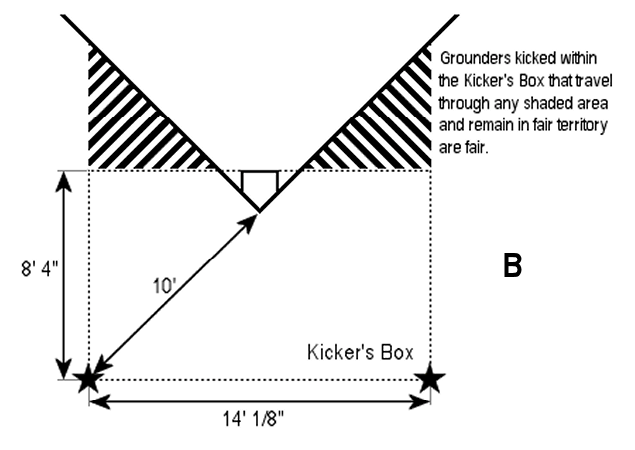 The kicker is not required to start in the kicking box, however the kick must occur within the kicking box (see Rule 9.02b).